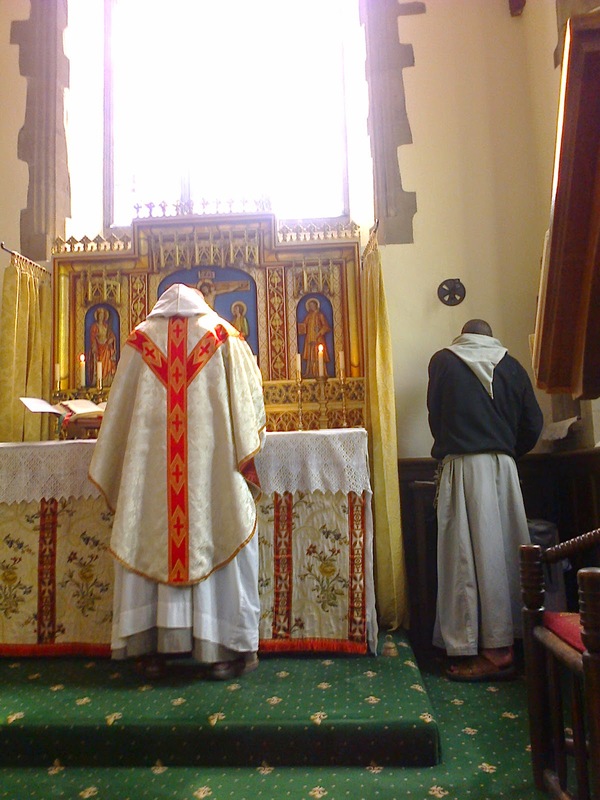 I knew when I went to Walsingham this year it would be different. The reason being that the new shrine director is Mgr John Armitage. He is from the east end of London. Similar to the Bronx in New York. He was used to every day being challenge. 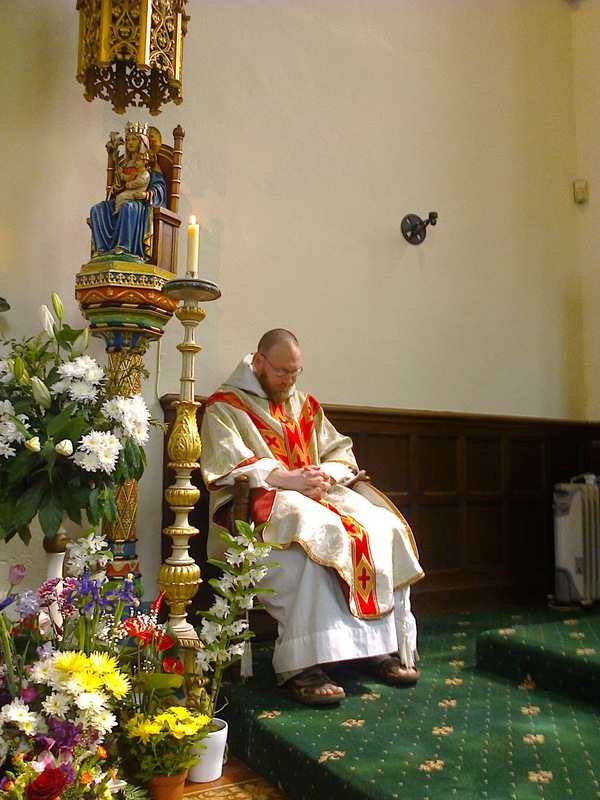 He has set himself a challenge in Walsingham. When I went to the first mass of the retreat our group was one of many groups who had come that day. One of the groups was one of the largest which had come for quite a while because it was the Brentwood Diocesan pilgrimage, Mgr Armitage's last Diocese. 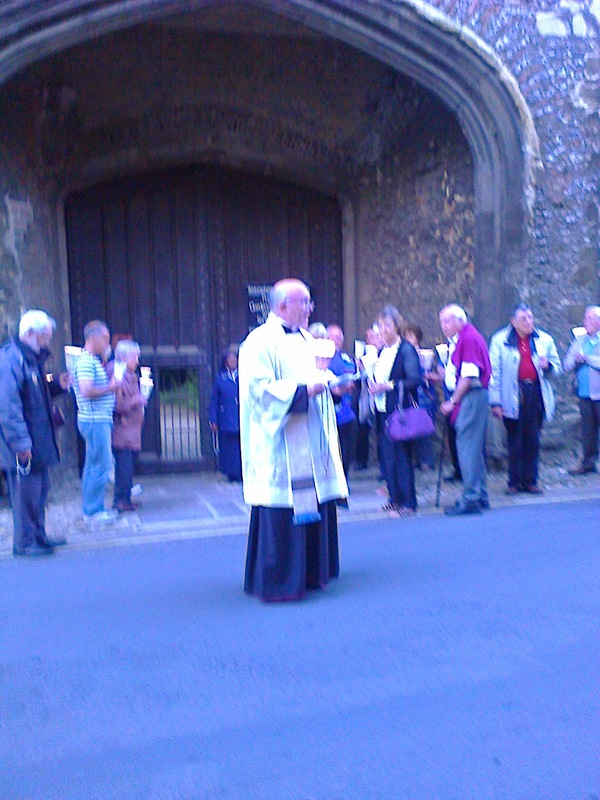 They not only came out to see him,but it was lead by Bishop Alan Williams, who in his previous role, was the shrine director of Our Lady of Walsingham. It was the wonderful feast of Pentecost. After the mass, Mgr Armitage introduced everyone to the 'blue bucket'. Plans are afoot to make huge improvements to the shrine (not before time) to the amount of £10 million. He has a bit to go, but with his enthusiasm the goal will become closer by the day. I know that I went home with a totally empty purse. Not a bean was left in it. Well I did have a couple of medals in it so I held on to them in the hope that it wouldn't be empty for long............and it wasn't. God is good. 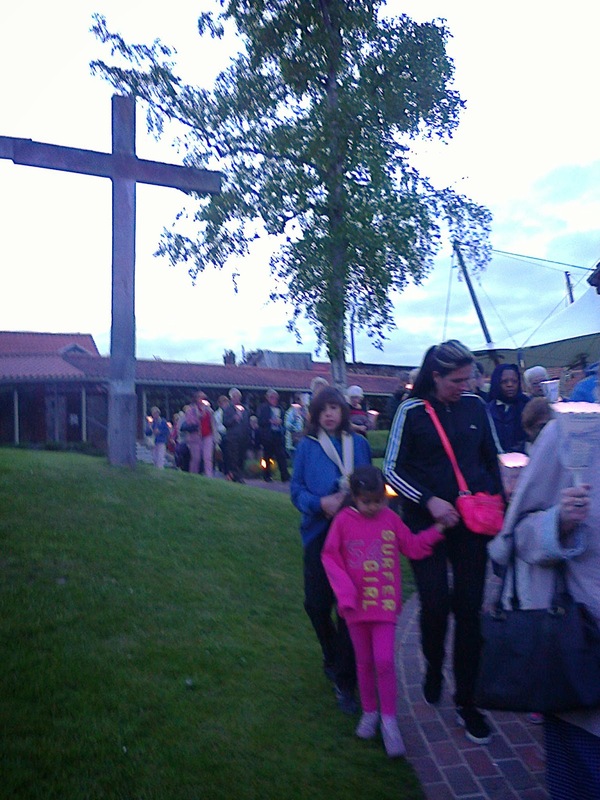 After a short service in the Annunciation church in Little Walsingham, candles were lit and the procession wound its way through the village, stopping for a history lesson outside the Abbey grounds to remind all of us how much suffering went on during the reformation. Behind the coach park is what is called the 'Martyrs Field'. The long procession continued towards the Anglican shrine where there is a replica of the 'holy house of Nazareth'. 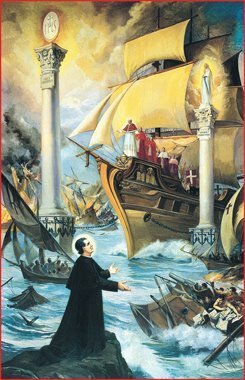 The Lourdes hymn was sung and the rosary prayers interjected in between. The music echoed round the streets and as we entered into the shrine gardens our group joined up with an Anglican group. Such a poignant moment. The Anglicans separated and continued into the shrine church. We then processed round the grounds and out again praying and singing back to the Friday Market where the Catholic church is situated. Joy and hope filled my heart. I am sure many more were affected by this unusual event --which will be not so unusual by the end of the summer.